GIS helped consolidate the city departments' existing geospatial data. The data model supports both point addresses and address ranges. Internal users and the public can view the city's GIS data layers, including orthophotography. Kansas City, Missouri, has recognized the value of geographyand GISfor many years. Like many other cities, however, it allowed individual departments to make their own decisions about which GIS platform to use, resulting in multiple GIS platforms. Some city departments used one legacy technology to manage city parcels, street centerline data, boundaries, and other significant data layers with a workflow that was closely tied to tiled data. At the same time, the Water Services Department (WSD) used this technology together with an asset management system from Esri Business Partner Hansen Information Technologies of Rancho Cordova, California, to manage its tiled water, storm water, and sewer network data. Meanwhile, the city's Web application was based on a different technology altogether, and a permitting system based on still another platform was used to manage parcels, addresses, and some permit information. The street centerline network was maintained as an Esri shapefile, and there were pockets of Esri technology in other departments, but there was no centralized database, and operations were department based. 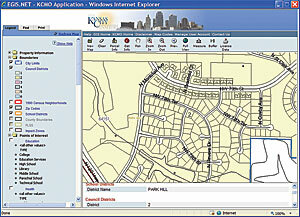 Kansas City's Web site features various mapping capabilities and also permits data to be browsed. It is used by the public, as well as internal City of Kansas City users. 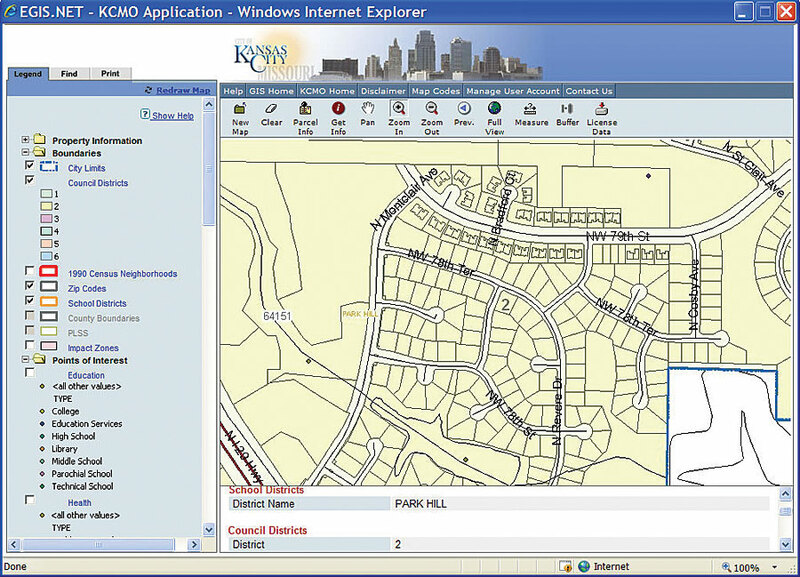 Kansas City's executive leadership realized that operational efficiencies could be achieved by using a single GIS platform, and in February 2005, the city contracted with Esri, assisted by a team of subcontractors, to standardize on Esri technology. Central to the management of the ensuing project were the Internet Technology Department and WSD, although a dozen or so other departments were also affected by the development of an enterprise GIS. All these objectives were met in the course of the ensuing project. The early stages of the project included a user needs analysis and a system architecture review. Thereafter, a system architecture design was developed that utilized a centralized operational database for ongoing data maintenance and a publication database for data access for Web users and other read-only users, including the public. Both databases are based on ArcSDE and Oracle. Users maintain the data in the centralized operational database, and this database is used to refresh the publication database so the latter can be made more current. A script runs periodically to push data from the operational database to the publication database. To maintain the data, the team developed software tools for the users in the various departments who have edit capability for the operational database. These users are primarily in the areas responsible for address, parcel, street centerline, and water/sewer maintenance. The maintenance tools for WSD were prepared by Esri Business Partner and subcontractor Marshall and Associates, Inc., of Olympia, Washington. Together, there are approximately 25 data editors and 100 query and read-only users for the database. The data model supports both point addresses and address ranges and is highly normalized to reduce redundancy. Standardized street names are stored in a base name table. This table contains only the root street names (First, Maple, etc. ), and only one occurrence of each name appears, eliminating misspellings. Linked to the base name table is a geoname table containing the full street namethe prefix, base name, type (e.g., Road, Drive), and suffix (if any). Each of these entities is a record in the geoname table. The result is a highly normalized data modelone in which redundant storage is minimized and sharing is facilitated through compatibility with other organizations that might use the data. To preserve WSD's investment in its existing data, ArcInfo was integrated with the existing Hansen system, which contains information about water, sewer, and storm water assets (hydrants, pipes, valves, etc.). The system stores both information about the status of these assets (e.g., active, retired) and information about the assets' characteristics (e.g., valve capacities, pipeline diameters). To satisfy the data requirements associated with the proper functioning of the system, planning for the ArcInfo/Hansen integration began with the user requirements process and continued with the database design process. As a result, the attribute information in the Hansen system is now synchronized with the spatial data in the ArcSDE geodatabase. Subcontractor Digital Ocean of Kansas City, Missouri, used ArcIMS to build a new Web site (www.kcmo.org/kcmo.nsf/web/maps?opendocument) for use by the public, as well as internal City of Kansas City users. The Web site features various mapping capabilities and also permits data to be browsed. To complete the implementation of the system, Esri provided Kansas City with several types of training: commercial off-the-shelf software training (approximately 25 students received training of this kind) and custom training to explain the use of the data maintenance tools and new workflows. For more information, contact Dawn Hilderbrand, GIS project manager, Kansas City (e-mail: dawn_hilderbrand@kcmo.org, tel. : 816-513-0839), or Charlie Wells, Esri project manager (e-mail: cwells@esri.com).